I got really nervous that I wasn't going to be able to read a new book this month. I have books to read, don't get me wrong. Plenty. 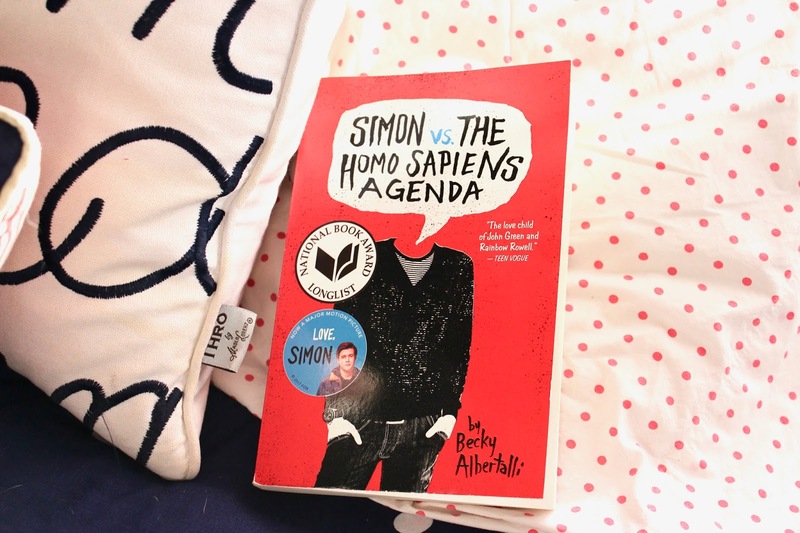 I even bought this book–Simon vs. the Homo Sapiens Agenda by Becky Albertalli–a couple of weeks ago assuming that I'd read it this month. And then I found out some stuff that you may or may not know about if you follow me on social media (if not, feel free to creep or I'll just be talking about it on the blog next week anyways) and just figured that I'd go into full-on panic mode and distract myself with everything but reading. And then I sat down on Monday and read this book in two sittings so...that was nice and convenient timing because my original post for today fell through. I knew I needed to read this book before I let myself see Love, Simon in theaters (if I actually end up being able to go). I really have just wanted to read this book for a few months now, especially after seeing people gush about it in my Goodreads feed and on social media. You know me, I like trends and things that are popular at the moment so I was bound to read this book eventually and....boy am I glad that I did. If you've never heard of the movie or this book before, it's about a sixteen-year-old boy (Simon, duh) who is a not-openly gay student at a school in the south. He has a secret e-mail friendship/relationship with an anonymous boy from his school who is also gay, but not out. One day, another student finds the e-mails on a school computer after Simon forgot to log out of his account and, essentially, blackmails him into setting him up with Simon's friend Abby, a new student from D.C. who has both Martin Addison (the blackmailer) and Simon's best friend Nick smitten. Simon is afraid that if he doesn't go along with it, Martin will out not only Simon to the whole school, but "Blue," Simon's anonymous e-mail penpal. Very few books somehow simultaneously make me feel happy while I read them while also bringing me to tears. 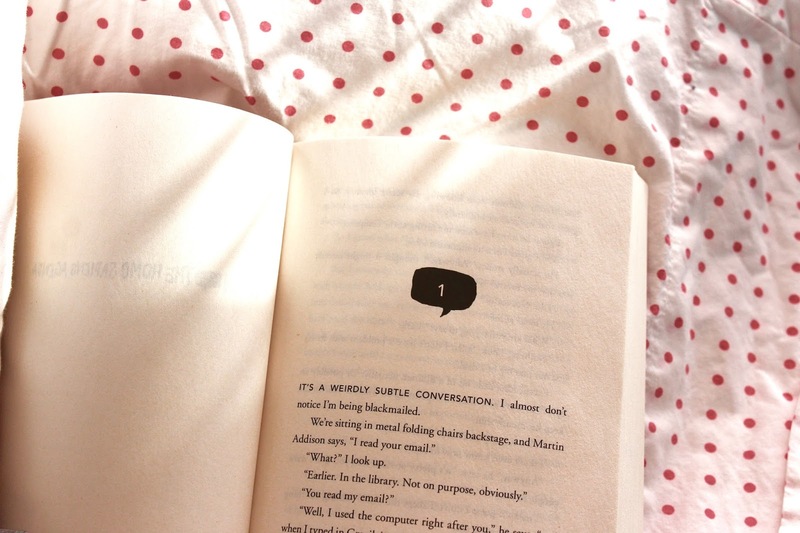 I know I cry a lot, but crying while I read books is really rare for me. But god, I couldn't control them in this book. It was so sweet and endearing and relevant? It was a dangerous combination that was just a recipe for disaster. And by disaster I mean tear central. Simon's group of friends are a breath of fresh air. There's Nick, a musician he's been friends with for years. Then there's Leah, the ultimate best friend who makes cakes for everyone's birthday and is there for you when you need a helping hand. She's got some stuff of her own, but she's there for everyone else when they need her. And of course, there's Abby, the new girl to the group that has Leah a little bit jealous, partially because Nick is smitten with Abby and Leah may or may not (okay...she does, SORRY!) like him. Something about this book gave me a really nostalgic feeling. It's been a while since I was in high school and this certainly wasn't my high school experience by any means, but the feelings in this were so real. I'm a big fan of coming of age stories and this one didn't disappoint me in the slightest. There's so much I could say about this book but I am really bad at giving away spoilers. Look, all I have to say is that if any book I talk about was going to be a must-read, I'm going to say that it's this one. It's light yet somehow heavy with certain situations. It makes you smile and laugh and cry and sympathize. Also, the soundtrack is great. That is all! Have you read the book or seen the movie yet? What did you think about it?